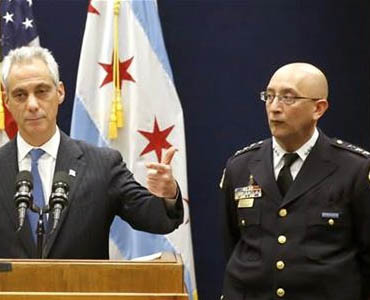 Of Arms and the Law: "Only police are competent to have guns"
"Only police are competent to have guns"
Chicago: policeman manages to accidentally kill a female bystander.. They also killed a 19 year old student, not by mistake. In related news, am I the only one that thinks this shows a third-world tinpot dictator introducing a rather unimpressive general? Well, I suppose that's not far off the mark. I have no information in reference to the "rather unimpressive general". Only if you mean, of the "Banana Republic" variety, and by unimpressive you indicate that almost willful slouch of the general's then, no. And that slouching in a public introduction indicates that he has been given no real authority and has not been assigned to accomplish one single thing different from the status quo. ...It's a three star something, but not a general. Our military wear their medals and ribbons on the left side, not their right. Probably the highest ranking dog catcher in Chicago. Standing next to the highest ranking little dog. Woof. And another question: does this new police chief command enough people to warrant three stars? Or two?